The CSKT-Montana compact became Montana law after being signed into law by the Governor on April 24, 2015. In accordance with Montana law, including Mont. Code Ann. §§ 85-2-217 and 85-2-702(3), the United States and the Confederated Salish and Kootenai Tribes have filed separate and independent claims for water rights for the Tribes in Montana's general stream adjudication. The Unites States and CSKT filings each claim on-reservation and off-reservation water rights. 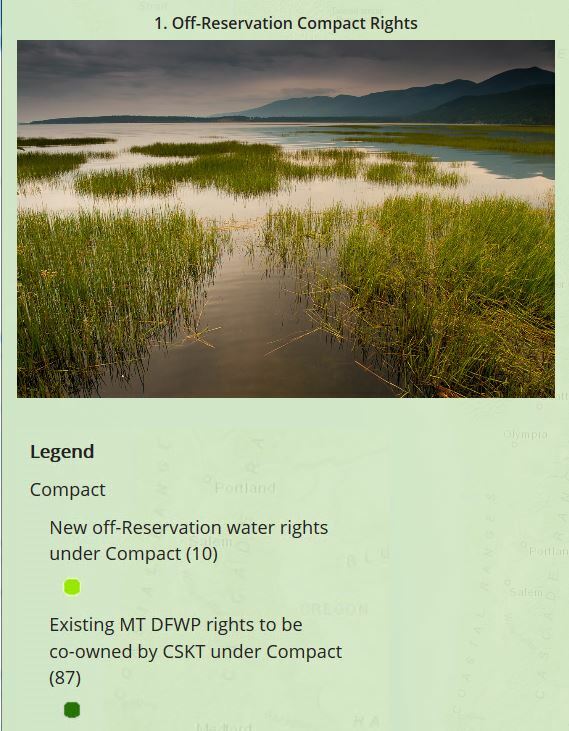 In addition, both filed claims to water rights for the Flathead Indian Irrigation Project. The Tribes and the United States have both petitioned the Montana Water Court to stay all proceedings on these recently filed claims, including claims examination, while efforts to ratify the CSKT-Montana Compact move forward at the federal and tribal levels. While these recently filed claims, like all claims filed in the Adjudication, are entitled to a presumption of validity under Mont. Code Ann. § 85-2-227(1), Article VII of the Compact provides that if the Compact is finally decreed by the Water Court, the Tribes and the United States will dismiss these recently filed claims. Moreover, if the Water Court declines to grant a stay or subsequently lifts it, there will be public notice of the entry of these claims in one or more preliminary decrees and of the opportunity to file objections whenever a preliminary decree including any of these claims is issued by the Court. See Mont. Code Ann. §§ 85-2-232 and -233.